I’ve always wanted to run a marathon cause then it would mean that I reached the pinnacle of my existence and everything in my life would be perfect. People who run marathons have perfect lives. Right? That’s why I haven’t run one yet, I can’t get my act together enough…that must be why. I’ve started training a few times and always fall off the band wagon. The closest I’ve ever come to my goal was back in 2011. I was in awesome shape. I was putting on high miles with ease. And enjoyment. I was keeping to my training schedule. I sometimes went for two runs a day! Mixed with the exercise I was eating right, all into my green smoothies and proteins. I wouldn’t even eat McDonald’s or drink Dr. Pepper. Yeah, I was a different person. I was setting out on my first really long run. An 18 miler. It was a beautiful evening, simply perfect. I had my awesome running mix pounding in my ears as my newly broken in sneakers pounded the pavement. I was in my groove – even breathing, long strides – I could run for forever. Then I hit the rude red hand of death. Kills the best grooves. I stood at the intersection jogging in place waiting for the signal to change. Then this kid, young man, probably about 10 asks me if this is the road up the canyon. I told him it was. Then my brain started churning. Why was this 10 year old out at dusk walking to the canyon. I stopped jogging in place and asked if he was okay. He said yes, but the kind of yes that is such a lie that you can’t even fake it to a sweaty stranger. The signal changed and I walked with him. We made small talk and I asked him how his summer had been. We got into nothing deep, sometimes when you’re dealing with something deep all you want to do is not talk about it. We walked for a bit, he started to liven up and even laughed. I mentioned that we should turn back since it was getting dark and he agreed. Eventually we passed where I had met him and a little ways further he turned onto his street. I waved bye and started to jog again (which totally sucked after stopping to walk – hello lead legs!). I ran up a hill, getting back into a groove and at least getting a good evening run in, even if I wasn’t going to hit my planned miles. As I ran a car came up beside me and frantically asked if I had seen a boy around 10. I told them I had, that he was headed to the canyon, but that then he turned around and was probably home. You could see such relief in everyone’s eyes in the car. I have no idea what was going on in this kids head. Was he just throwing a little fit and teaching his parents a lesson by disappearing for a few hours? Did he always intent to just go for a walk to blow off some steam then return home? Or was he headed up the canyon for more dismal reasons? I have no idea. I never will. But I do know that I was touched upon by the spirit to disregard my seemingly lofty goal at hand and to talk to that kid. 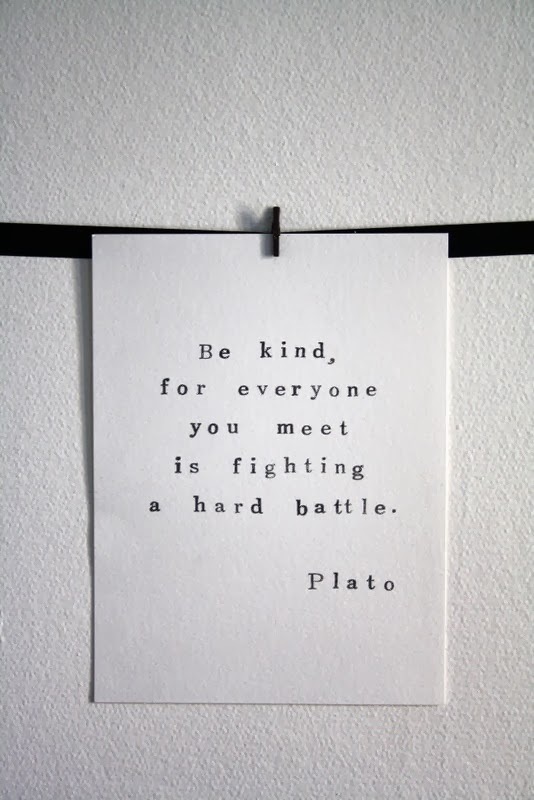 Be kind, for everyone you meet is fighting a hard battle. I’ve been thinking on this a lot recently. I’ve gotten caught up in my own seemingly important stresses and worries and I’ve ignored a lot of others that are fighting hard battles. Not on purpose, of course, but I’ve had my head in the sand. There are people who have unintentionally hurt me, and I’ve been nursing those wounds instead of letting them heal and thinking about their battles and how I could help them. To finish off the story, I hurt my knee as I ran down the hill that night. I had to call my roommate to pick me up cause I couldn’t even make it the last mile home. It took over a year to heal (would’ve been faster if I would’ve kept off it!!) and I haven’t gotten back into running, at least not like that. But that night gave me a perspective shift. I frequently have moments of bitterness that I’m no longer a runner or that I haven’t run a marathon, but they’re accompanied by this sweet memory. Totally worth it. Maybe someday I’ll run a marathon. I still run a little, even while pregnant. An extra 30 pounds makes it tough! And I have to pee the second I start, even if I just went. I made it all the way around the block this week without stopping! Well, I had to stop once to pick up Stella’s poop. A welcome break, even if sucking air while picking up dog crap isn’t ideal – still, I’ll take it. What goals have you given up for something better? I agree whole heartedly with being kind to all whenever possible...and it is always possible. There's a chance to be kind and forgiving every time you encounter another being. Agreed! I'm rarely intentionally rude, but I often find opportunities to be kind pass by me because I'm oblivious! Need to stop to smell the roses and look around you, I guess. I've given up every major goal I made for my adult life. Sometimes that makes me sad, but mostly it makes me glad that we don't have to spend the rest of our life chasing what we thought was a good idea at 18 years of age.